Naadam festival in Ulaanbaatar. Wrestling. Archers. Horse riding. Legend tour. Naadam festival in Ulaanbaatar. Wrestling. Archers. Horse riding. Three games of men. The biggest event of the Mongolian year for foreigners and locals alike is the Naadam Festival held in July in Ulaanbaatar. ft is also the main draw card on most tour programs. Part family reunion, part fair and part nomad Olympics, Naadam (meaning 'holiday' or 'festival') has its roots in the nomad assemblies and hunting extravaganzas of the Mongol armies. Even today, Chinggis Khaan's nine yak tails, representing the nine tribes of the Mongols, are ceremonially transported from Sukhbaatar Square to Naadam Stadium to open the festivities. The communists renamed the festival People's Revolution Day and fixed it to July 11 to 13, on the anniversary of the Mongolian Revolution of 1921. However, in country centers close to Ulaanbaatar, Naadam festivities may be held before or after the major festival in Ulaanbaatar. Some people like to attend both the local and national celebrations. The quality and number of sports and activities at Naadam festivals in the countryside will be lower than in Ulaanbaatar, but at a country Naadam you are more likely to get better seats, witness genuine festivals tainted without the tourist's brush, and even make up the numbers during a wrestling tournament! Watch out! Some travelers visit the smaller Naadam at Zuunmod, an hour's drive from Ulaanbaatar, which is held at the same time as the capital's. Naadam festivities are also held at different times in the Kazakh and Buryat regions (a large Buryat Naadam was held in Dashbalbar in Dornod in late July 2000). Unless you are really keen on the three main (and manly) sports, the festival itself can be a little disappointing and may not be worth coming specially to Mongolia to see. The opening and closing ceremonies, the associated activities and shows, and the general joy around the country, though, are reasons enough to base a visit around the Naadam Festival. Bear in mind that accommodation can be scarce during Naadam, and prices are often higher than normal. Book your hotel in advance or get there a few days early to tee up your room. You may not bother seeing everything that Naadam has to offer. However you should try to make it to the following: the ceremony in the Sukhbaatar Square, from there go down to the stadium to see the opening ceremony. Wait for the first few rounds of the wrestling, then maybe wander off to see the archery and watch the Mongolians outside the stadium. Perhaps watch the horse racing on day two, and see the closing ceremony later that day. On or about August 9, another tourist-oriented Naadam Festival called Baga Naadam (Small Naadam) is held. Some travel agents may sell you a program including this inferior festival. 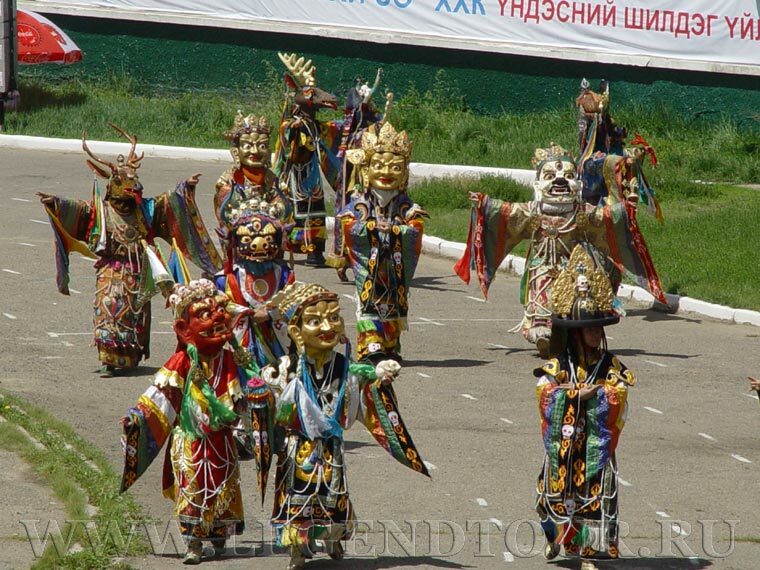 The best and original Naadam Festival will always be held from July 11 to 13 in Ulaanbaatar. Wrestling, archery and horse racing are held during the first and second days. Very little happens on the third day, so get drunk the day before, and use it to recover from a hangover like everybody else does. During the three days, few restaurants and shops open and virtually no-one works. Day one starts at about 9 am with a fantastic, colourful ceremony outside the State Parliament House at Sukhbaatar Square (often missed by visitors). Hundreds of soldiers in bright uniforms play stirring warlike music on brass instruments. Mongolians - dressed in Chinggis-style warrior outfits - parade around the square, then circle Parliament House before marching to the Stadium. The first round of the wrestling, which starts at about noon on day one in the main stadium, is the more interesting and photogenic. Later rounds can get boring - most Mongolians don't bother returning to the stadium until the final rounds on the second day. If the wrestling gets too much, walk around the outside of the stadium and watch the interaction between Mongolians. This can be far more interesting than what is happening in the stadium. Also worth a look is the changing of the guards. The horse racing can attract well over 1000 horses (so watch your step; this is dung city). During the festival, you may see dozens of horses being herded down the main streets of Ulaanbaatar, as if they were on the steppes. The horse racing is held at the village of Yarmag, about 10km along the main road to the airport - it is very easy to spot. The atmosphere is electric, and there is always plenty to watch. A recent addition to the Naadam program is anklebone shooting. This entails using a hand-propelled mini crossbow to flick sheep ankle-bones, a row of which are set up as a target. The competition is held in a separate hall, normally near Naadam Stadium, but the location is never fixed so ask around. Tickets to the stadium (except for the two ceremonies), and to the archery and horse racing are free, but to the opening ceremony foreigners pay US$12, and US$8 for the closing ceremony. A ticket does not usually give you a seat number, so get there in plenty of time for a good position, especially for the closing ceremony, when good seats may have been taken during the afternoon. If on a package tour, your travel agency will arrange tickets. If travelling independently, getting a ticket to the opening and closing ceremonies can be tricky. From 4 to 10 July, you can buy tickets from the Central Stadium Company and you can normally buy tickets at the stadium before the two ceremonies. Guest-house owners normally help their guests buy tickets. You can find plenty of warm drinks and cold khuurshuur (fried meat pancakes), as well as ice cream, bread and a/rag (fermented mare's milk) around the outside of the stadium. Take an umbrella or hat, because most seats are not undercover, and it will either rain or be hot. Naadam is properly known as Eriyn Gurvan Naadam, after the three 'manly' sports of wrestling, archery and horse racing (though women participate in the first two events). Winning at Naadam carries great prestige and financial reward. The 2000 Naadam offered T1.5 million of prize money to the winning wrestler and T600.000 to the winner of the main horse race. Mongolian wrestling is similar to wrestling found elsewhere, except there are no weight divisions, so the biggest wrestlers (and they are big!) are often the best. Mongolian wrestling also has no time limit- the bout will continue with short breaks. It will end only when the first wrestler falls, or when anything other than the soles of the feet or open palms touch the ground. Wrestlers wear heavy boots called gutui - similar to the traditional boots worn by ordinary Mongolians. The tight, unflattering pants are called shuudag, and the small vest across the shoulders is azodog. The open-fronted vest was allegedly introduced after one Amazonian-sized female wrestler floored all the male wrestlers. When it was discovered she was a woman the vest was introduced to ensure that women would no longer take part in bouts (and thrash the men!). Winners are bestowed glorious titles depending on how many rounds they win. These are nachin (falcon) - five rounds; zaan (elephant) -seven rounds; and arslan (lion) - given to the winner of the tournament. When an arslan, or lion, wins two years in a row he becomes an avarga, or titan. One renowned wrestler was given the most prestigious, and lengthy, title of the 'Eye-Pleasing Nationally Famous Mighty and Invincible Giant'. Mongolia's most famous wrestler is currently Bat-Erdene. You will see plenty of wrestling if you are in Mongolia during the Naadam Festival, or during the Ikh Sorilgo (Major Test) tournaments in the weeks before Naadam. Archers use a bent composite bow made of layered horn, bark and wood. Usually, arrows are made from willows and the feathers are from vultures and other birds of prey. Traditionally dressed male archers stand 75m from the target, while women archers stand 60m from it. The target is a line of up to 360-round gray, red and/or yellow leather rings (known as sur) on the ground. Usually there are only about 20 or 30 rings. After each shot, special judges who stand near the target (but miraculously never get injured) emit a short cry called a uukhai, and raise their hands in the air to indicate the quality of the shot. The winner who hits the targets the most times is declared the best archer, or mergen. it is just open countryside, which leaves great scope for cheating. Jockeys - boys and girls aged between five and 13 years old - prepare for months for special races, particularly at Naadam. Horses are fed a special diet for weeks beforehand. The competition is not without its dangers: in 1999 a young rider was tragically killed during one of the horse races. Before a race, the audience, all decked out in traditional finery, often sings traditional songs. The young riders sing a traditional anthem called a gingo before the race, and scream 'goog' at the horses during the race. The winner is declared tumnii ekh, or 'leader of ten thousand'. Riders and spectators rush to comb the sweat off a winning horse with a scraper traditionally made from a pelican's beak. The five winning horses are admired and talked about in reverence by the crowd, and traditional poems are read out, extolling the virtues of the riders and trainers. The five winning riders must drink some special airag, which is then often sprinkled on the riders' heads and on the horses' backsides. During Naadam, a song is also sung to the two-year-old horse that places last. Tour N 105. 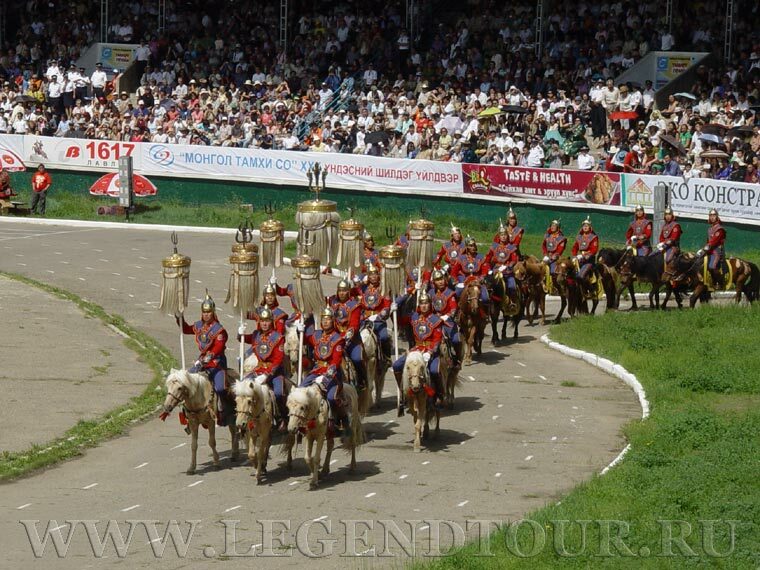 Naadam festival tour (Ulaanbaatar) – Kharakorum (7 days/6 nights). Photo album. Naadam Festival in Ulaanbaatar.